This year has come and gone so fast, its not funny... and I am sure many of you echo these thoughts. As has been a tradition for a few years now, a round-up of the great gastronomic experiences is what I like to do on the blog. So here you have it - the last post for 2014 and a recap of some brilliant experiences. Do click on the photos for detailed links if you would like to read more. The year began with a food trail inside the Bengaluru International Airport. We went through both the international and domestic terminals and it was an interesting route to take through an airport. The blog post now features on the home page of the BIAL website. We got introduced to breakfasts at Church Street Social. This up here is Sid's Posh Breakfast. I personally love Riyaaz's Breakfast of Champions. Of course, Social has also been the venue for many a get-together, quick meal and celebration across this year. This is also the year we began to discover Miltry hotels across Bangalore. Some great food memories associated with the concept. Up here is the Mutton Palav at SGR in Cottonpet. Quite a few posts in the coming year will be on this subject. For a couple that loves Japanese, we discovered another place that made us happy - Matsuri at the Chancery. Lovely place and very pleasant Japanese food which does not dent the wallet too much. This was also the year that I was introduced to Ottimo - Chef Vittorio gives innovation a whole new meaning with his take on Italian cuisine. His brand of hospitality is special. High Ultra - set way up high on the 31st floor of the World Trade Center brought in a new way of celebrating the weekend. Great drinks, great food and an ambiance that is unbeatable. Chef Manu Chandra loves to put a new spin on things and thankfully we are on the receiving end - The Fatty Bao made a superb debut and its the small plates and drinks that have me bowled over. Though Mamagoto offered us a smorgasbord of dishes it was the Vegetarian Laksa that stood tall and bright. Of course, a lot of the other food was also superlative. 2014 has also been a year of some really interesting experiences. Top on my mind is the Pay as you Please 3-course Krsma wine paired dinner at Red Fork. Everything from the wine to the food was brilliant beyond belief. Up here was the Cauliflower risotto with cocoa jelly and textures of cauliflower - a dish I would like to have a thousand times over. Sudhakar attended this brilliant Whisky tasting event by Shatbhi Basu and he still talks about it. A lovely experience to remember this year by. The Food Lover's Gourmet City is an annual event and we were invited to a menu tasting at the Le Jardin. While the entire meal was memorable, it was the poetically plated dessert that still comes to mind. Called Textures of Berries, it truly was a celebration of berries. At the Social Media Week, earlier this year, a few bloggers were invited to the launch of a new menu at Fava and were asked to blog live about the entire affair. 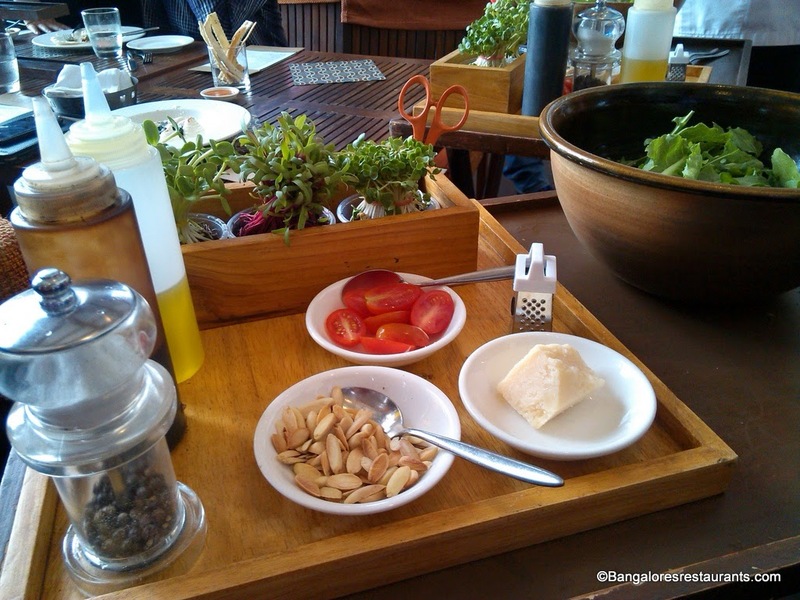 A lot of interesting things came to the table but what I loved the most and have had several times after is the Micro-greens salad that is freshly cut and tossed together at your table. Yes 2014 has been quite an interesting year as far as the culinary experiences go. There is so much I have planned for 2015 and hope to share with all of you. Cheers to a great year ahead. Have a safe and tummy happy New Year.